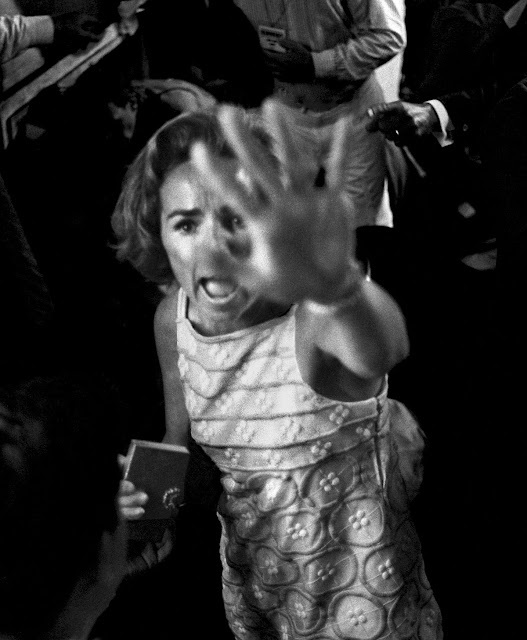 Harry Benson has captured this moment of raw emotion and trauma perfectly. Her outreached hand is blurred and slightly obscures her face, yet her eyes engage the viewer and reveal her anguish. Just after securing this shot, Benson was knocked to the floor by a Kennedy aide. Instinctively he changed films and hid the valuable spool, which featured many of his iconic pictures of the scene, down his sock. Legendary photographer Harry Benson is best known for his intimate photographs of the Beatles, but his wide-ranging career as a journalist spanned pop culture, politics, and social upheaval; from relaxed photos of celebrities like Princess Diana and Michael Jackson to shots of the Berlin Wall coming down and scenes of Martin Luther King Jr.'s funeral. 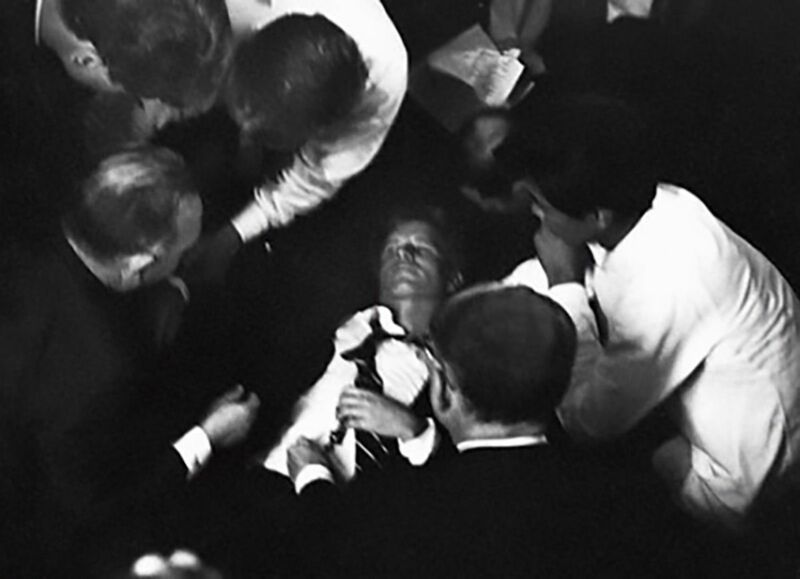 His front-row seat to history includes the day that Bobby Kennedy was tragically shot in Los Angeles in 1968. 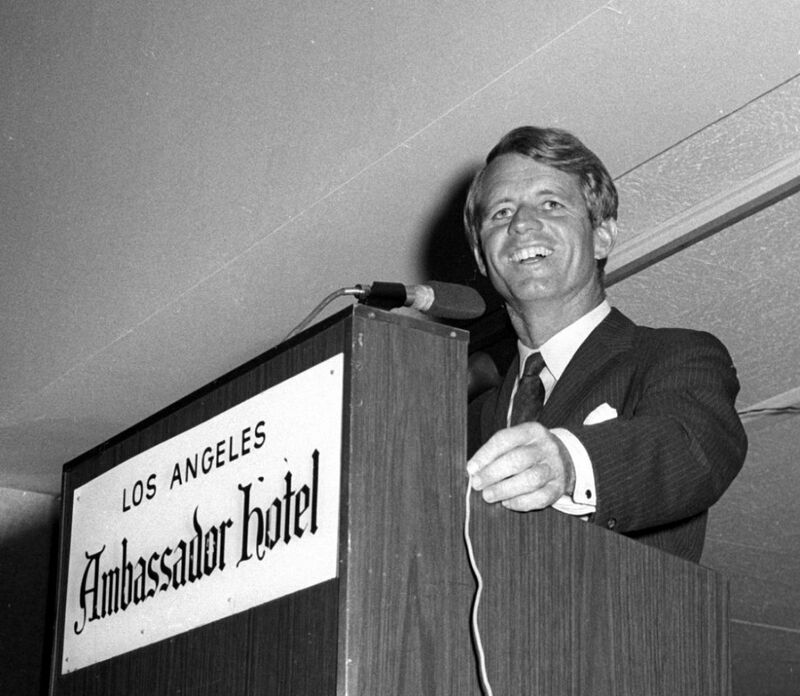 Kennedy was giving a speech at the Ambassador Hotel after winning the California presidential primary when he was shot several times by Sirhan Sirhan, a 22-year-old of Palestinian descent who felt betrayed by Kennedy's support of Israel. Five others were also wounded in the attack; Kennedy died the next day. “You’d thought of yourself like the guy in the bar who would say, ‘God if I was there that night—I would have done this, I would have done that.’ Now, I’m there; Now I’ve got to do it. So my main thing, purpose was to get as close as I could to Bobby, take pictures and walk around there,” Benson says of the famous night in Los Angeles. “I put the film in my sock, because if a policeman comes up to me and says, ‘I want your film,’ and he’s got a gun, I want to photograph for Life magazine; I don’t want to die for it,” Benson recalls.